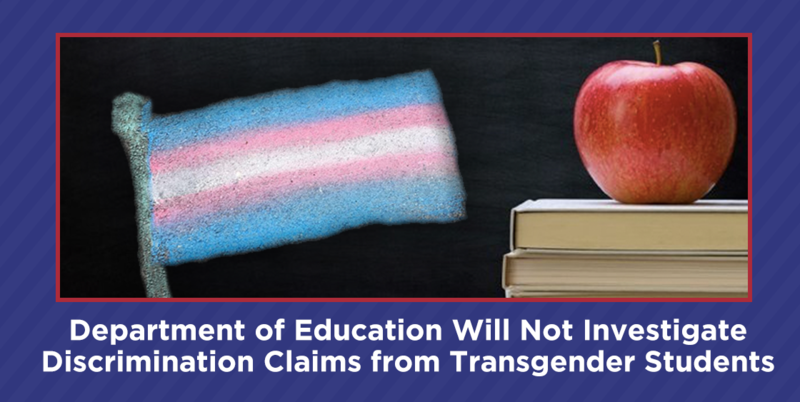 After months of seemingly small rollbacks on protections for transgender students, the U.S. Department of Education today confirmed that it has all but abandoned its mandate to protect all students from discrimination. BuzzFeed reported today that the Department of Education will not investigate or take action on any complaints filed by transgender students who are not able to use the restroom that aligns with their gender identity. Under President Trump, the Department of Education – along with other federal agencies including the Department of Health and Human Services and the Department of Justice – have systematically unwound Obama-era measures that protected LGBTQ Americans from discrimination in varying forms. One year ago, the Department of Education rescinded federal guidelines on how public schools can best ensure dignity and safety for transgender students. Since then, the department has been inconsistent and unclear on whether they believe they have jurisdiction over matters involving transgender students who face discrimination. The Obama-era guidance was put in place not just because of growing legal precedent, but because of growing awareness of the acute need for educators to provide safe and equitable environments for all students – including transgender students. Seventy-five percent of transgender students report feeling unsafe in school, according to a recent GLSEN report. And, a study by The Williams Institute found that more than 50 percent of transgender young people report attempting suicide at least once in their lifetime. The department’s dismissals of transgender students’ discrimination complaints contradict several recent court decisions on behalf of transgender students, including a landmark ruling from the U.S. Court of Appeals for the 7th Circuit which found a school’s anti-transgender restroom policy to violate the U.S. Constitution’s Equal Protection Clause and Title IX of the Education Amendments of 1972.